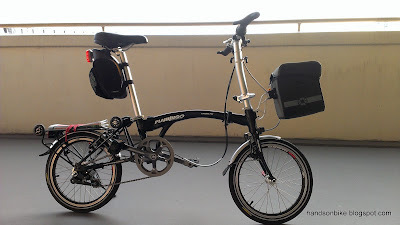 In my previous post, I had attempted to put on a riser bar onto my Flamingo London NX7. However, it was not possible as the bends on the riser bar could not fit through the clamp on the handlepost. Someone then suggested using a special stem to raise the height of the clamp area, and then insert a straight bar through. That is actually a pretty good idea! 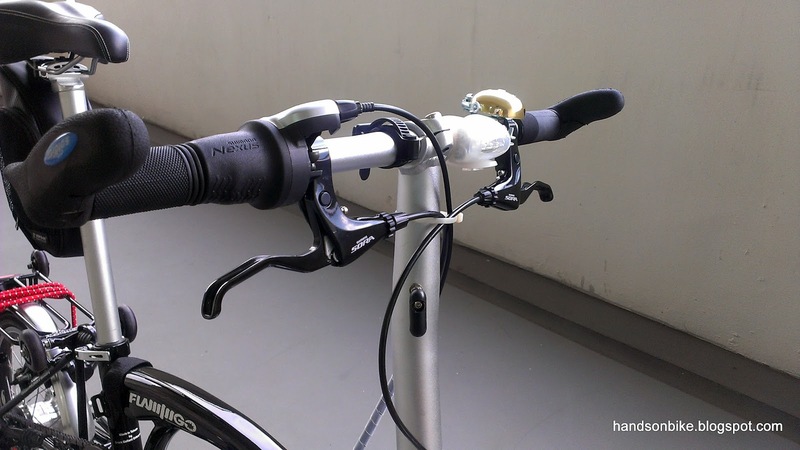 The special stem is actually the same type that I had used on my Dahon Boardwalk, to increase the reach of the handlebar. Check out my bling bling gold stem here! 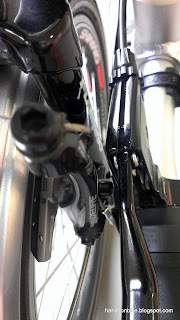 Alas, I could not get a stem in silver colour to match with my handlepost. Also, I was worried that with the clamp, there is a chance that the stem will rotate around the clamp when the handlebar is pulled hard. 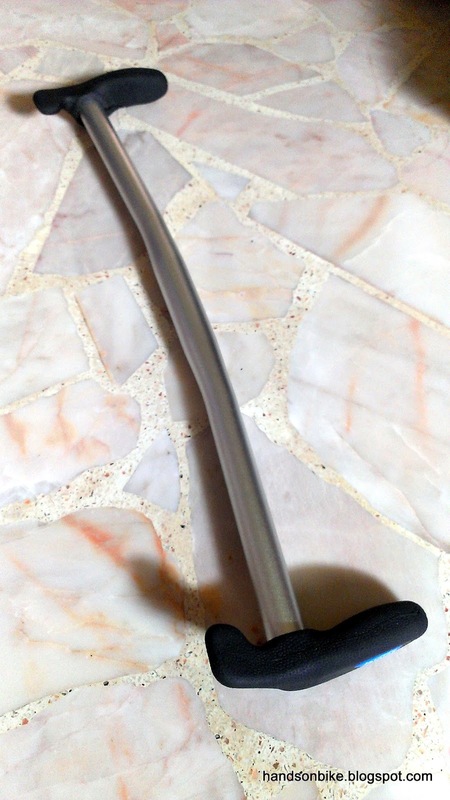 At the recent lelong sale, I chanced upon a very nice flat handlebar! It was in fact an original Brompton flat handlebar. Since it was going for a good price, I decided to get it first and think later. Thanks Wei Shuan for offering it for sale! 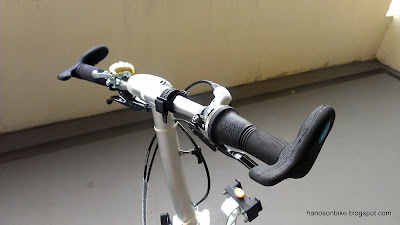 With that handlebar, I thought I would just install the flat handlebar directly onto the handlepost! 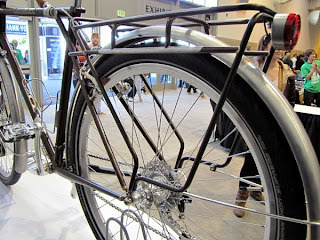 No need for any riser bar or stem to increase the height. Just go for a low sporty position! 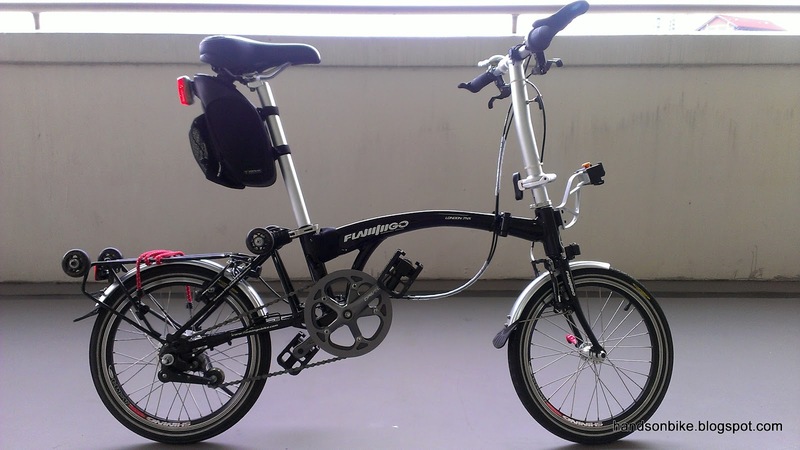 The clamp area on the Flamingo handlepost is 920mm off the ground, which is quite similar to the Brompton S2L (935mm, as seen from the brochure). 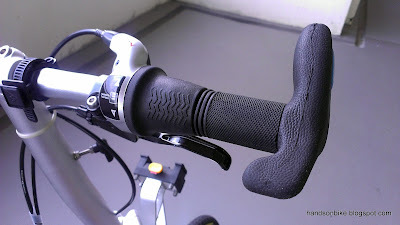 Also, I managed to get bar ends during the lelong sale, thanks Desmond! 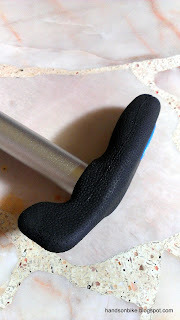 Nice bar ends with grippy soft rubber, and very comfortable support for the palm! 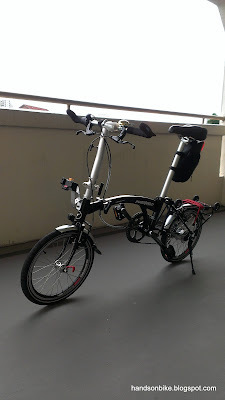 Installing the new handlebars was not difficult, but quite troublesome as I had to remove and reinstall everything on the handlebar. 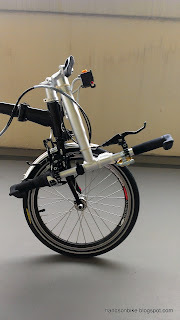 I wanted to try the riding position with the flat handlebars before shortening the cables, as it will be quite troublesome to shorten the cables. New flat handlebar, with lots of excess cable slack! The ride feel is definitely very different! With the low handlebar position, there are both positives and negatives for me. 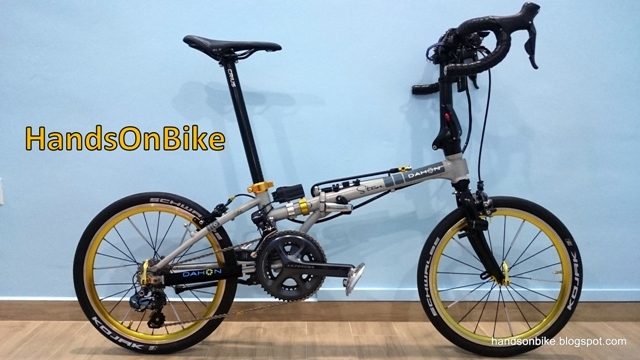 But first, let us look at some more pictures of the transformed bike! All accessories on the flat handlebar. Great bar ends. Really really comfortable shape and texture! Although some bits of rubber does come off and stick to your hand. Not an issue though. The flat handlebar when folded down. Much further away from the ground! Handlebars, before and after. The handlebars have been lowered by about 16cm! The cable housings have also been shortened to remove the slack. Very agile and light feel to the bike. Transforms the bike into a sporty bike. 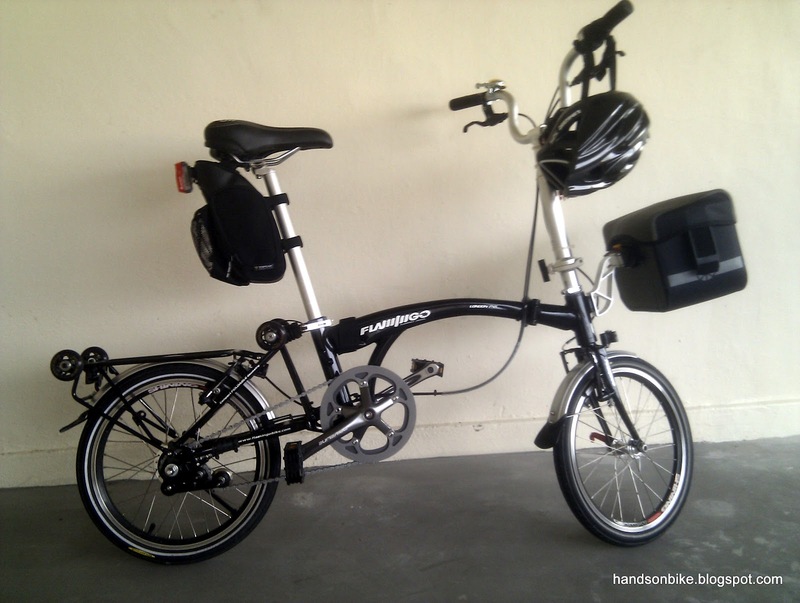 No flex even when pulling hard on the handlebars, due to the low handlebar position. More aerodynamic position. Not really important for me though. Lower weight compared to the original M handlebars. Not so important and significant anyway. Bar ends are great for improving the comfort. Usually I will just set to gear 5 and pedal on! Low body position might not be comfortable over longer distances. But then again, I wouldn't use this bike for long rides anyway. Body weight shifted more towards the front. Got to be more careful when going down slopes. 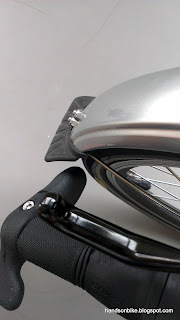 This is a pretty big modification to the bike, as I have totally changed the riding characteristics of the bike. Quite an interesting mod, and it really livens up the ride! If I may suggest naming this Flamingo after the Brompton model naming norm, this would be a Flamingo S7R? More pictures below! 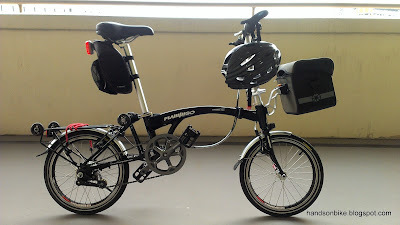 I know it's been a few years since you added anything to this post but I am curious if you explored different Brompton Clones & which ones you would & would not recommend. Thank you. There have been a few good clones recently, but I still got a real Brompton as the clones are still lacking in some areas. 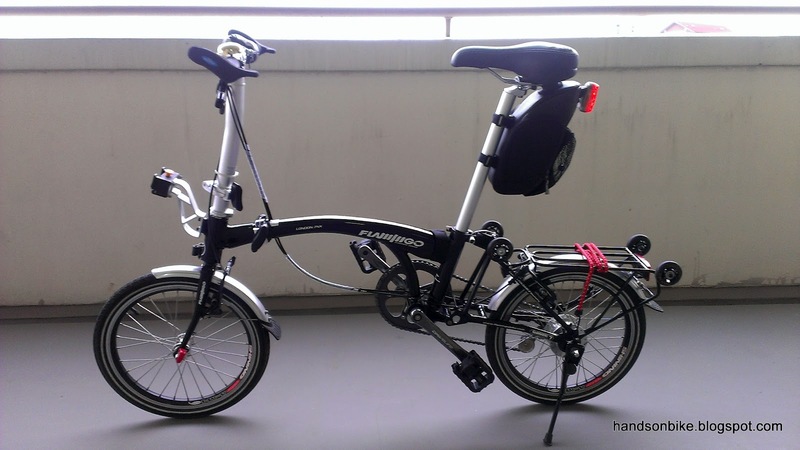 There are now good quality Brompton clones that are better than the Flamingo.